Right after creating a project, you break down your plan into workable entities called Tasks. These tasks are assigned to the users in your project and it is accomplished within a defined period of time. You can copy a task, set duration, priority, reminders, set recurring frequency etc. And, when you complete a task it's easy to mark it as complete and store it in the closed tasks. After completing a task, you may want to edit it, if so you can do it by reopening the task again. Take a quick glance at how you can work with tasks. Click to learn more about access privileges for Tasks. Click Projects, select the required project and then click Tasks. Click Add Task in the upper-right corner. Enter the task details and then click Save to add a new task. While adding new tasks, you can now, attach and share screenshots of any web page or screen related to the task using the screen-grabber option. Click found in the right end of Drop files or add attachments here, and paste or attach the required image, and then click Done to upload the screenshot. An inbuilt draw tool lets you highlight what is important and blackout what you don’t want in the screenshot. A feed is generated whenever you add or delete a file or attachment to a task. In Task List choose a task list from the Internal option if you want to display the task only to your portal users. However, if you want to collaborate and display the task with client users, you must associate a task list from the External option. You can also add tasks using the Add Task link. In addition, you can create tasks right within the Home page. To do this, click View More in My Tasks. To set duration for a task instead of End Date, click Enter Duration and enter the number of days in Duration. If the Start Date of the recurring task occurs on a holiday or a weekend, the previous working day is automatically set as the Start Date. This option is enabled only if the Recurring frequency of the task is set to Monthly or Yearly. In the selected project, click open the required task in Tasks to edit. 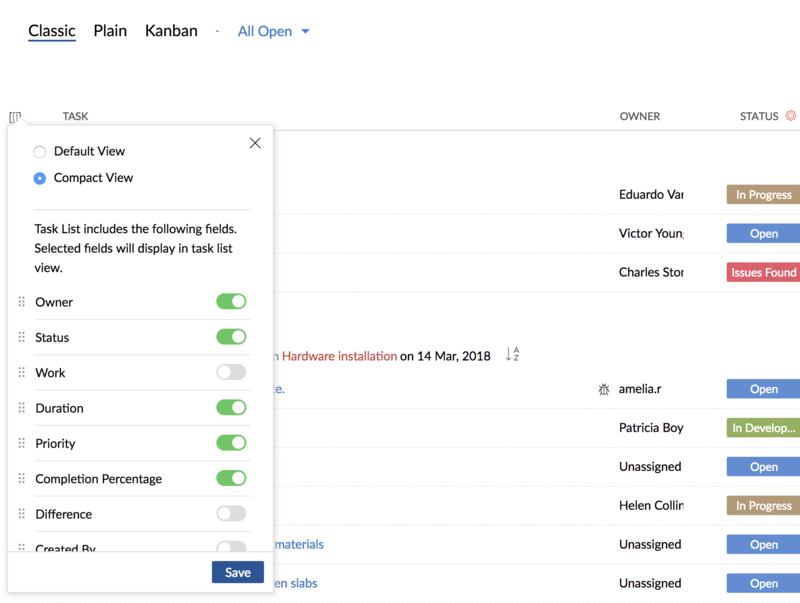 You can edit the task in Classic, Plain and Kanban view. You can modify task details such as task comments, description, subtasks, log hours, documents, forums, and so on. While editing the comments, if you want to attach files or screenshots of any web page, just click screen grab in Drop files or add attachments here and paste the required image, then click Done to upload the screenshot. It's an inbuilt draw tool lets you highlight what is important and blackout what you don’t want in the screenshot. While you edit, you can also navigate to the next task or task lists. Users with Related permission in View, can only delete tasks without subtasks. Likewise, you can also delete a task. Select the task and click in the upper-right corner. This deletes the tasks along with the associated timesheet entries and delinks the set dependencies (if any). 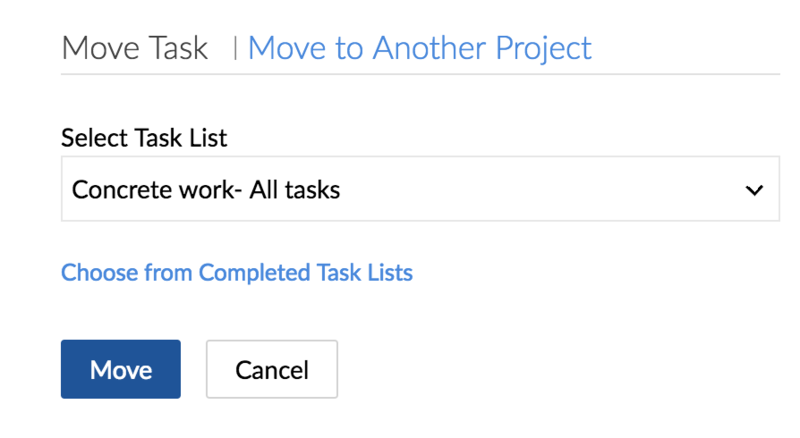 You can move tasks to another task list or to another project. Navigate to the task you want to move and click on it. Select a task list to move the task to and then click Move. The task is move to the new task list. Click on Move to Another Project and select a project. Choose the required task list and then click Move. The task is moved to a new project. 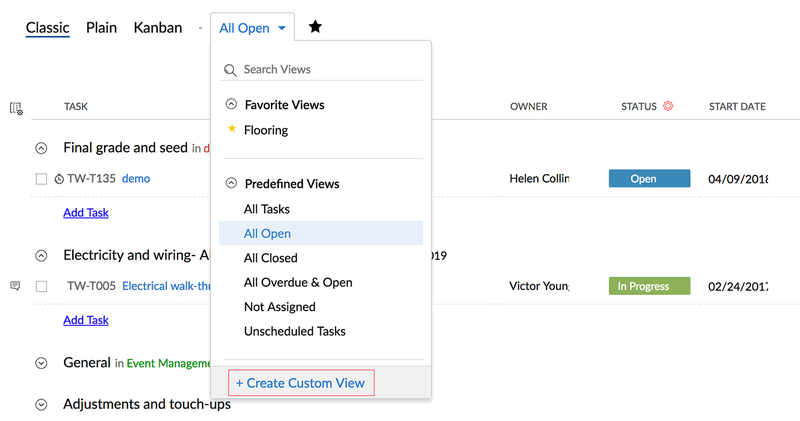 Zoho Projects supports 3 different type of task view: Classic, Plain, Kanban. Classic Default view for task lists and tasks. You can customize your columns in the classic view. Plain This view is sorted based on due date. It displays all tasks and its dependencies with the task level. Kanban Kanban cards are an easy, dynamic way to create and visualize your workflows. Task lists and tasks are visually arranged, so every team member knows the tasks and subtasks in every task list. Tasks and issues will have an auto-generated unique ID with a prefix. Unique IDs are efficient to track, identify, and search tasks. Also, you can # mention them in feeds, status, and comments to specify tasks and issues. Once a task is deleted, the Task ID number of that task will also be deleted. All Task IDs are unique, a deleted task ID will not be reused for subsequent tasks. 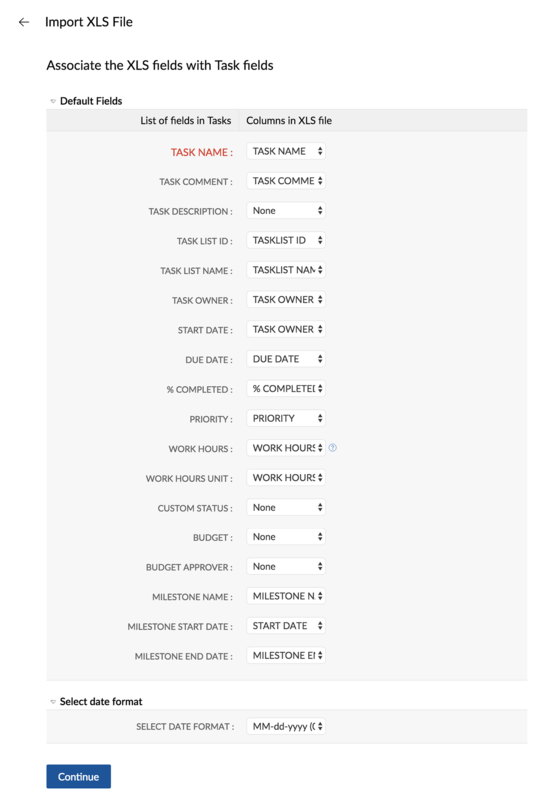 Task custom view is an option to customize and filter your tasks based on specific criteria. For example, if Helen is assigned to the design department, she can customize her view so that she will see all of the tasks specific to the design department. Here is a quick run-down on how to create a custom view. Click on more views and select Create Custom View. Select the criteria for your view. Click to add more than one criteria and click to delete the criteria. AND is used when it is mandatory to satisfy all the criteria. OR is used to satisfy an either-or condition. If there are any changes in criteria pattern, click Edit Pattern and Update changes. Enter the Custom view name, Description and select Accessibility. You can edit or delete your custom view anytime you need. Just hover over your custom view to view the Edit and Delete options. 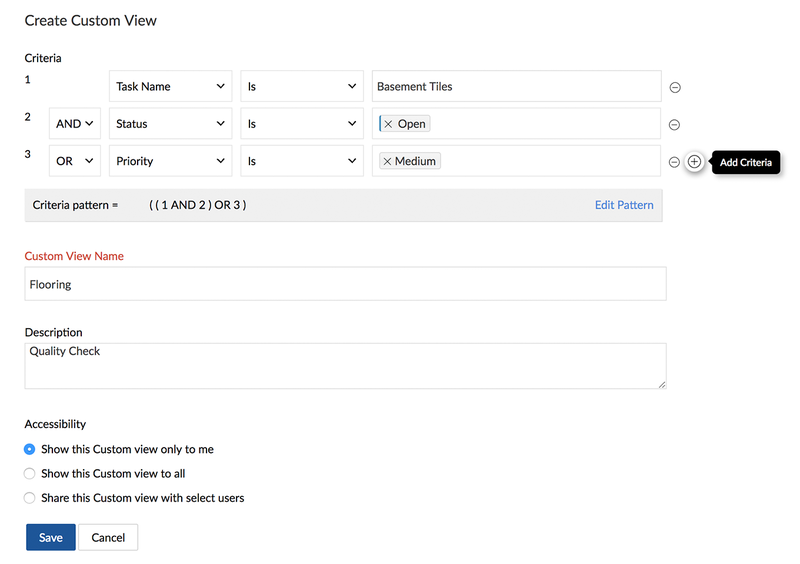 Filter criteria can either be saved to an existing custom view or as a new custom view. Click Save Results To, and choose New Custom View. Favorite views display the list of all your favorite custom and predefined views. Hover over a custom or predefined view to enable it, then click to add that view to your favorites. You can click again to remove the view from favorites. You can set a maximum of 20 criteria in a custom view. Generate Custom View based reports in the Reports & charts section. Custom Views cannot be set in project templates. 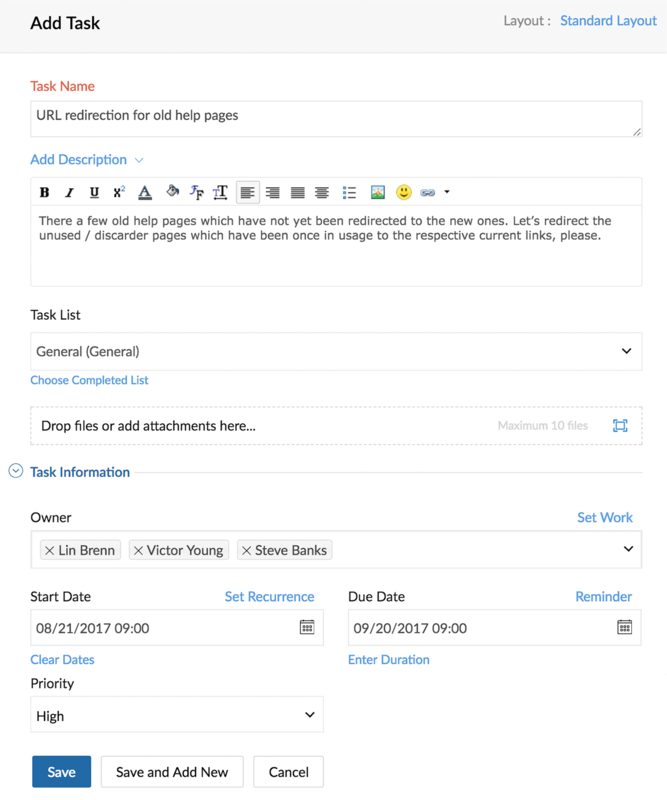 From My Tasks widget, you can view all your tasks and you can filter your tasks based on task custom views that you have created across different projects. Navigate to My Tasks widget in your portal Home. Click View more to see all your tasks. Select a custom view from the drop-down. When you apply a task custom view, all your tasks that match the criteria across projects will be displayed. 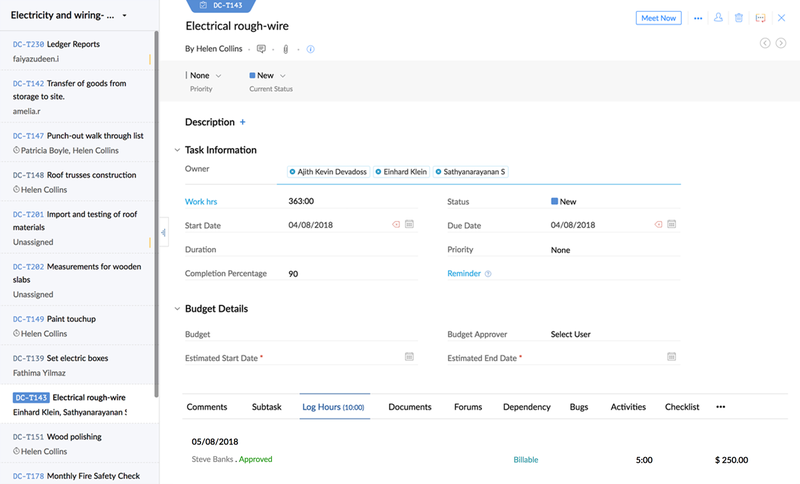 If you have set custom fields as criteria, the layout specific tasks will be displayed, i.e the tasks that match the criteria across all projects associated with a particular task layout will be displayed. If you have set Milestone or Task List as criteria, the project specific tasks will be displayed, i.e the tasks that match the criteria for a particular project will be displayed. You cannot create a task custom view from My Tasks. Customize task views by enabling or disabling columns. Navigate to task view (Classic or Plain). Enable or disable the columns using the selector. 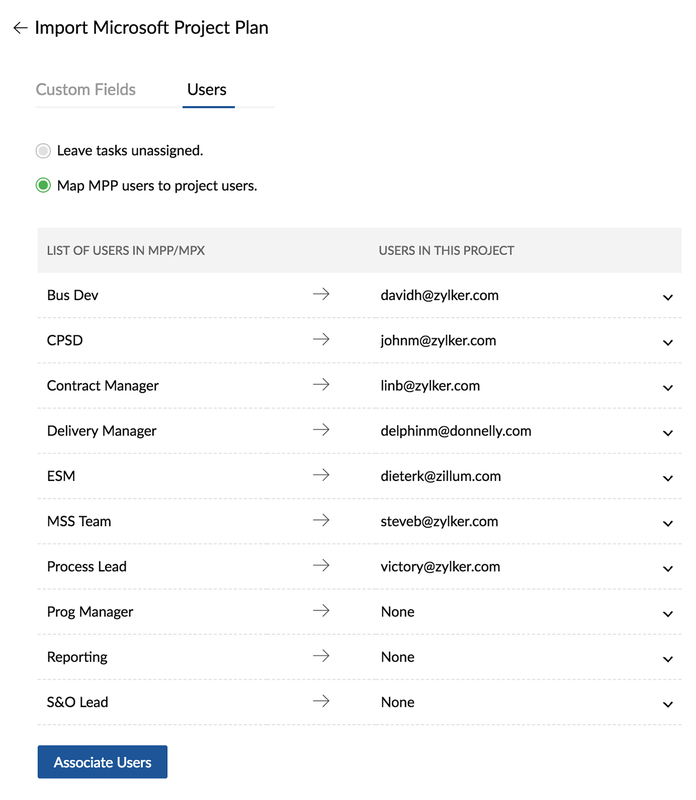 You can now import MPP/ MPX/ XLS/ JSON/ CSV files into Zoho Projects and start collaborating. Select a project in Projects and choose the Task module. In Classic View, click in the upper-right corner and then choose Import Task. Click Choose File and then select the desired file to import. You can either leave the imported tasks unassigned or associate it with the existing project users based on your requirement. Associate the imported file with their corresponding task fields and then click Continue. To note, when you import the work hours of a user along with their respective task information, ensure to use the following keys while importing. Choose the required option in Import XLS Wizard to schedule the import. If you map the TASK OWNER to the corresponding xls field, and continue to import, the Import XLS File wizard is displayed. 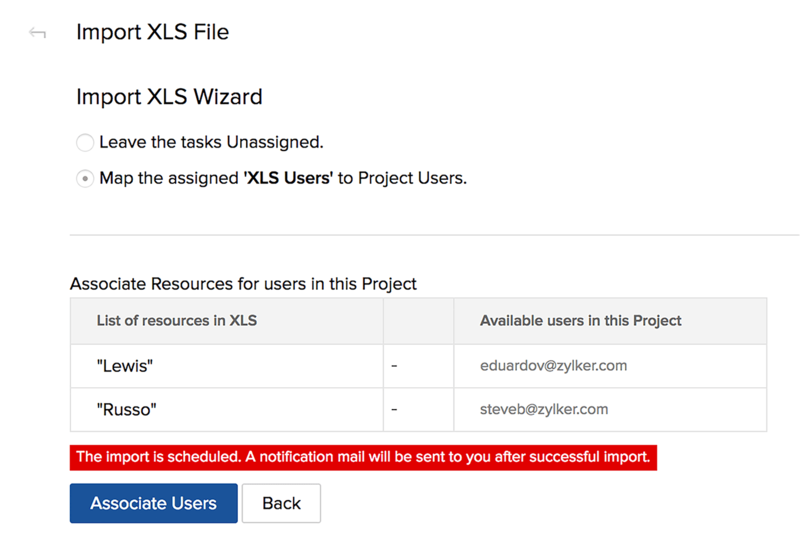 In this wizard, you can choose to leave the tasks unassigned or associate the xls users to project users. 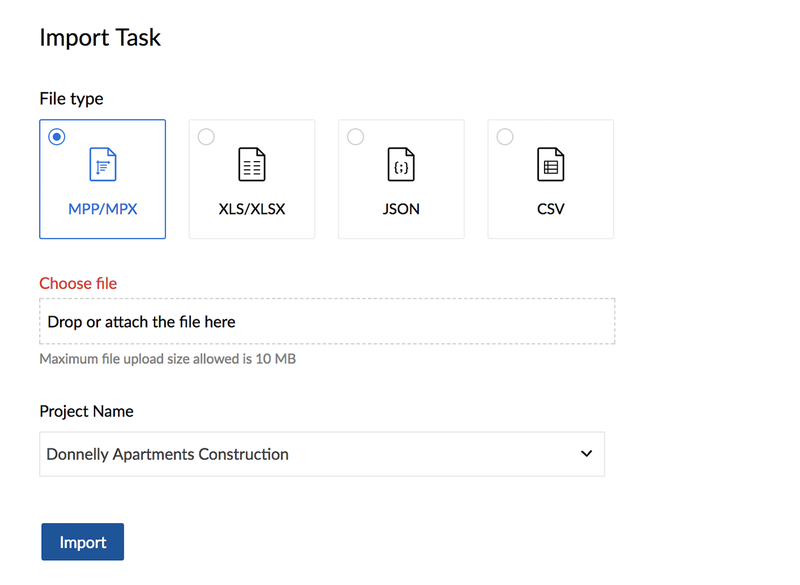 Zoho Projects supports multi-sheet files for task import. Headers from the first sheet will be used to map the fields in Zoho Projects. Single line text fields are limited to 255 characters and pick list values are limited to 100 characters. Entries exceeding the character limit will be truncated and imported. Download a sample XLS ,CSV,or a JSON file here. While importing, if you map only the TASK LIST ID, the corresponding task list alone is imported, even if there are identical task list names. However, if you map the TASK LIST NAME, all the available task list with the given task list name are imported irrespective of their task list ID. Sorting tasks helps you to focus on specific information for any desired column in project management. In Classic View, you can sort tasks. Click and then select the desired column criteria to sort tasks based on its Priority, Start Date, End Date, Created by and % Completed. Select the required task list and click Reorder in the bottom. Then, click in the upper-right corner. Now, sort the tasks based on the columns and click Save Order to retain the changes even after you refresh the page. You can sort only parent / main tasks. Select your project from the list. Click a task for which you would like to view the details. Create an online meeting for your task if required. Click here to learn more about our Meeting Integration. Click the cross icon to close the details view. You will be able to modify the field values right from the details view. Hover over a field to update its value . You can also set dependency between tasks. Select Dependency tab from the bottom tray and click the Gantt bar to link tasks between same or different projects. Know more about setting dependency between tasks. 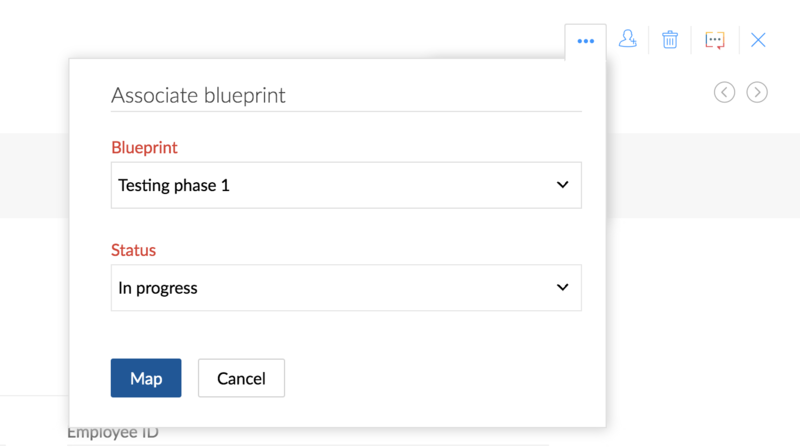 You can apply a blueprint to your tasks from the task details page. Navigate to a task and click on it to view its details. Select a blueprint and then select a status to map the task. Click Map to apply blueprint to the task. Click the chat icon to start a discussion or to post a task update. The task owners and creators are the default participants. Besides, you can also delete or edit a conversation. To edit or delete a particular conversation hover over it, click and select Edit or Delete option. You can also set reminders for tasks. Stay on track and don't miss out on any project updates.